HI!!!!!!!!! How is everyone??? Today is a quick post about dot gradient manicures. So, the first one I ever did was because of an idea from my friend, Lo. She suggested I do a teal dot gradient over a neutral color. I did it and I was so happy with the result. Last month, I did a pink one for a Valentine's Day idea. It was an ALL PINK dot gradient but I kinda liked it. Today I have a purple dot gradient for you. I also made this into a video tutorial for anyone who was interested. Please check it out below the pictures. I hope you enjoy the post! Let me know what else you'd like to see a video for! 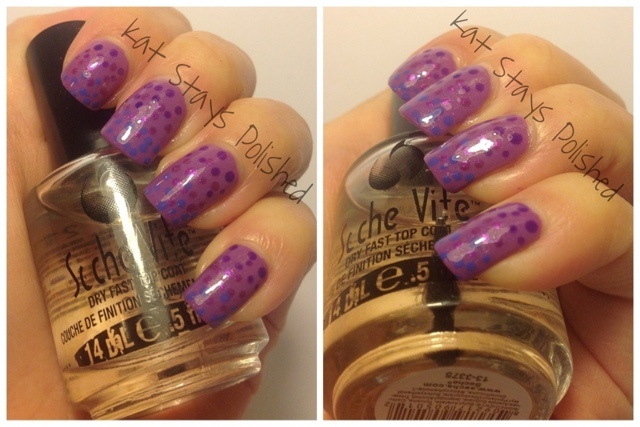 Learn how to do this EASY dot gradient mani!